The Ultimate Guide to the new iPad, on sale now! | What Hi-Fi? The Ultimate Guide to the new iPad, on sale now! The Ultimate Guide to the new iPad is your complete guide to Apple’s latest and greatest tablet, brought to you by What Hi-Fi? Sound and Vision and Stuff. Inside you’ll find expert insight into the tech that makes it tick, a massive 20-page Supertest featuring in-depth reviews of all the key tablet contenders for the iPad’s crown plus, of course, tests of all the accessories you’ll need to get the very most out of your shiny new iThing. On top of all that, you’ll find a comprehensive guide to no fewer than 450 of our favourite iPad apps, so whether you’re a committed gamer or a sports freak, a mobile muso or a movie addict, we’ve got you covered. 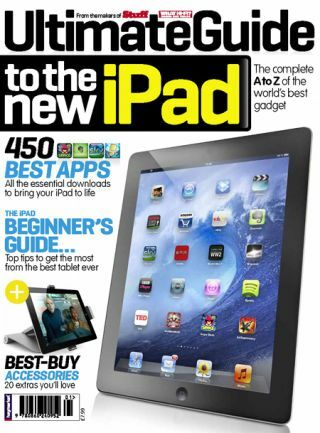 The Ultimate Guide to the new iPad is available from today in newsagents across the UK.